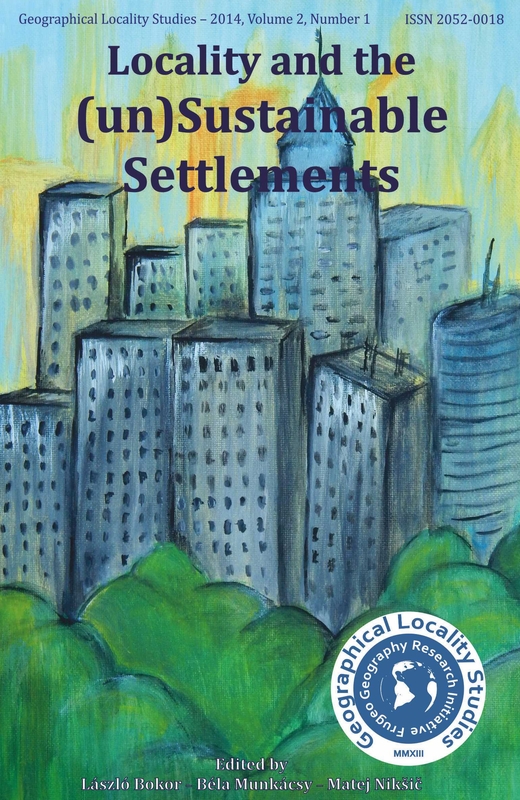 This second number of Geographical Locality Studies dips into locality by analysing the World’s settlements (villages, towns, cities) and their composite structures and complexity. The aim of the multidisciplinary editors and authors is to highlight the urban areas to give understanding about their suitability in the context of 21st century thinking of environmentalism and sustainability. The various articles analyse some parts of the Earth’s urban environment and bring examples from different locations of the planet to show how a settlement (or anything that strongly relates to the human sphere) is sustainable or unsustainable. This present issue gives publicity to 9 scientific papers which were written by an international team of expert researchers, higher education lecturers and specialist masters students. The diversity of their subject specialism (which involves geography, environmental science, urban planning, environmental management) provides a wider analytical view on the main topic of the journal; therefore, their tasks were to show specific examples brought over from their specialist and research areas to introduce the reader to locality, settlement planning and their sustainability, efficient management of urban transport and energy related topics. In accordance to the tradition of Frugeo Geography Research Initiative’s GLS series, “Locality and the (un)Sustainable Settlements” is commemorating the life of József Tóth, an exceptional scholar and academic who greatly influenced and shaped the modern human geography at an international level. He suddenly died on the 7th February 2013, but his work and achievements will always be found and traced in settlement geography. The authors’ aim is to identify and understand the key factors of a local entity that may help to work out a simplified measuring method to analyse a certain locus. Their approach goes through defining classic terms like space and time, locality, sustainability and the combination of the two latter ones. Also, the initial step of creating the Need Model and Geographical Locality Index is now made. If it is assumed that the biosphere is a single living entity, cities can be compared to the tumours in a cancerous body. They take material and energy from their surrounding areas and they charge them with the waste of their metabolism. The aim of this paper is to compare the evolution, the development and the operation of the urban area to a cancerous body. The paper is a critical review of an open public space regeneration programme in the city of Ljubljana, Slovenia. The point of departure is a belief that an important measure of the sustainability of any settlement is the accessibility of quality open public spaces for its inhabitants. The paper analyses the open space improvements through the distribution of the investments. This paper looks at cause and effects of mobility needs and key fields of energy use with a view to the Jevons paradox and the rebound effect. A line of thought is applied to the relation of energy use with climate, culture, habits and comfort, various heating solutions and the respective role of production, trade and ser­vices. In a case study, the eco-village of Gyűrűfű is also analysed. The main objective with the present study is to investigate how urban green spaces impact on the air quality and the microclimate in cities. Each section examines an urban climatic process and how it differs in an urban environment which includes vegetation. It also discusses how urban green spaces can help ease the local consequences of climate change. One can find both green zone and brown zone investments amongst recently developed residential areas in Frankfurt. The traffic infrastructure is designed to catch up with the development of those new residential areas. Several districts of the city provide good examples to show the way in which the mentioned two closely related fields can be jointly investigated. This paper presents the concept and the main forms of community ownership. Analysing the literature and the cases of Güssing, Austria and Samsø, Denmark helps to recognise how to promote a successful local renewable energy project and what kind of additional benefits may be earned by applying the appropriate ownership model and project outline. Presently, a hot debate is taking place in Hungary and Poland about the use of biomass for electricity generation in existing coal power stations. The arguments are of technological, logistic and foremost of economic nature. The aim of this paper is to set two ways of biomass power generation against each other by analysing the biomass sectors of the two countries mentioned above. The spread of the small business sphere in the rural areas of India could have a significant role in order to decrease the spatial and social differences derived from sociocultural and demographic reasons. The authors provide a thorough overview of the production and labour force positions of the enterprises taking part in the Khadi & Village Industries Program.